Sometimes finding a good, easy, portable breakfast option when eating low-carb or keto can be tough. I love my recipe for Easy Make-Ahead Egg Muffins, but they aren’t something you can carry in your hand. So I figured maybe I could make something with a crust that would be easier to hold on the go. 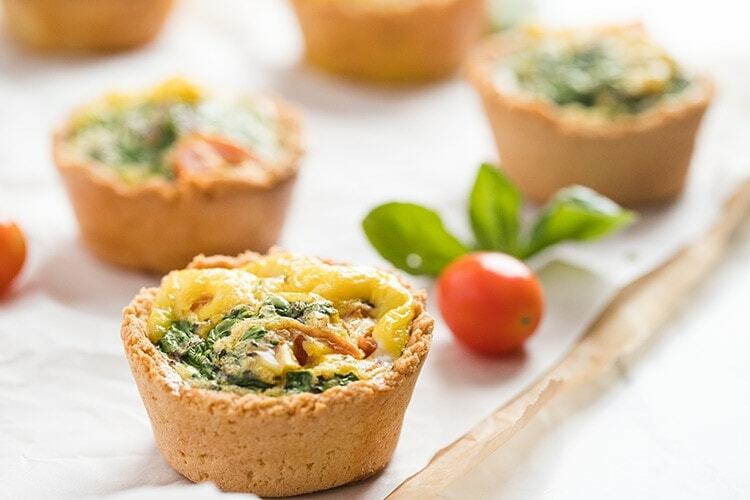 And so I bring you, Easy Make-Ahead Low-Carb Mini Quiches with Almond Flour Crust. It’s a long name. But an easy concept. Ya’ll most likely already know what a quiche is. These are just mini. Individual portion sizes. Made in a muffin tin. The elegance of a quiche, the portability of a muffin. Healthy veggies added in. They’re delicious. They’re fun. So just go and make them. You won’t regret it! Oh, and I did I mention? You don’t have to be eating low carb or keto or gluten free to enjoy these! They are a great healthy breakfast option any day of the week! 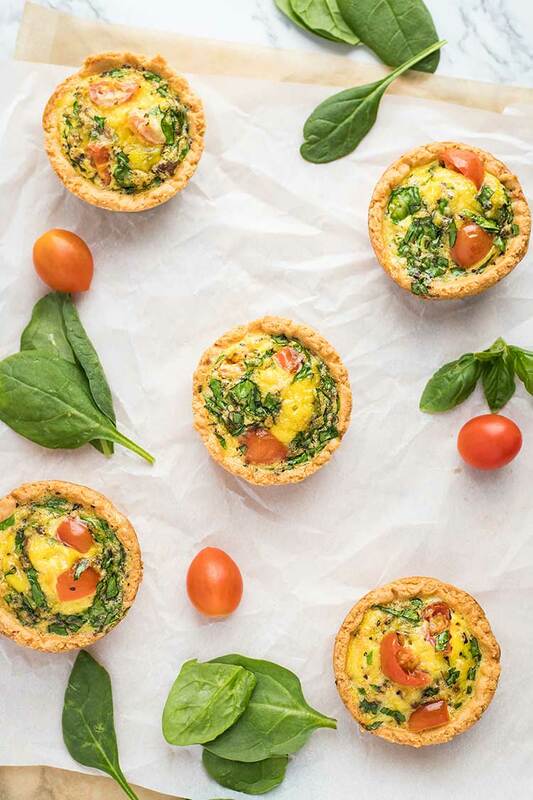 Using almond flour for the crust on these mini quiches helps them qualify to be low-carb and gluten-free. It’s a very basic dough, with a little seasoning thrown in there to up the savory factor. Because it is pretty dense, I find it best to just mix in a bowl with a spoon, rather than use a mixer, but either will work. 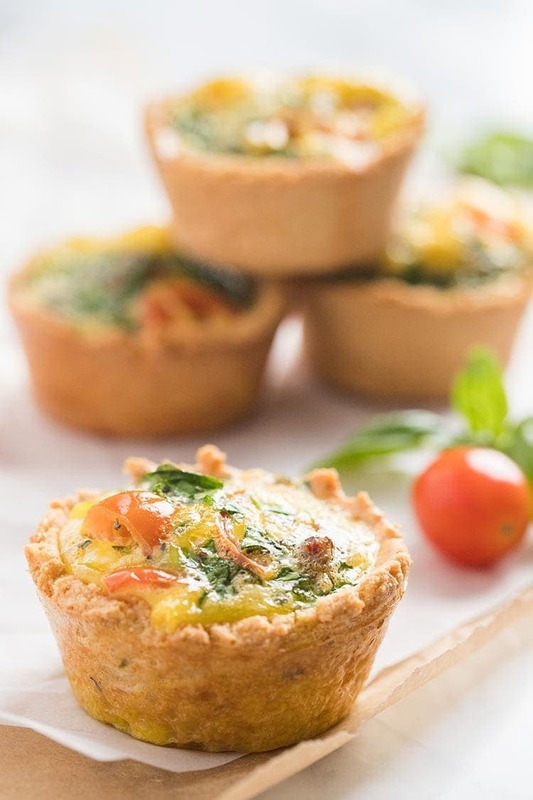 What I absolutely recommend though, to make these mini quiches qualify as “easy” is to get yourselves what is usually referred to as a tart or pastry tamper. Having made half a dozen batches of these the “old-fashioned” way, by smooshing the dough up the sides of the muffin tins by hand, I can tell you, this little tool will make this a CINCH! Seriously, I wouldn’t recommend attempting these without one. I mean, sure, it’s possible. But it is SO tedious. So just trust me and get one of these. It’s worth the $11. You can thank me later. Also, make SURE you spray your muffin tin liberally with a non-stick cooking spray of your choice. These have a tendency to stick, even with the spray. And wrap your tamper in plastic wrap and spray with a little bit of cooking spray. It helps the tamper not stick to the dough. I use one of my scoops to dish the dough so I get the same amount in each muffin cup. You don’t have to use one, although it does make it easier. You can use a regular tablespoon measure – you should be able to get 2 tablespoons of crust dough in each muffin cup. It will be a fairly thin crust. But I’ve done that on purpose, as almond flour can be very crumbly and dry. I’ve made them thicker in the past, but it almost overwhelms the filling. So I think these are good medium. If you find that you like a thicker crust, go with 3 cups of almond flour and 3 eggs. You can lower the carbohydrate count a little by leaving out the tomatoes. But it isn’t a terribly big difference. Or toss in your own add-ins. I sometimes make these with just sausage and cheese added in, and they are fabulous! Dairy-free option: Replace the heavy whipping cream with unsweetened coconut or cashew milk. To freeze these low-carb mini quiches, I just let them cool a bit on the counter and then put them into gallon freezer bags. I don’t have any trouble with them sticking together, so I don’t bother to flash-freeze them first. I’m lazy and generally just reheat them in the microwave for an easy keto breakfast. Doing so will take away a tiny bit of the “crunch” in your crust, but I don’t mind. In some ways I like it just a little softer. I usually nuke two of them for 30-60 seconds. I always reheat from thawed. But theoretically you could reheat from frozen. It’ll just take longer (probably around 2-3 minutes). You can pull out a big bag of quiches, and leave them to thaw in the fridge, then just pull a few out over the next few days. They keep well for up to a week in the fridge. 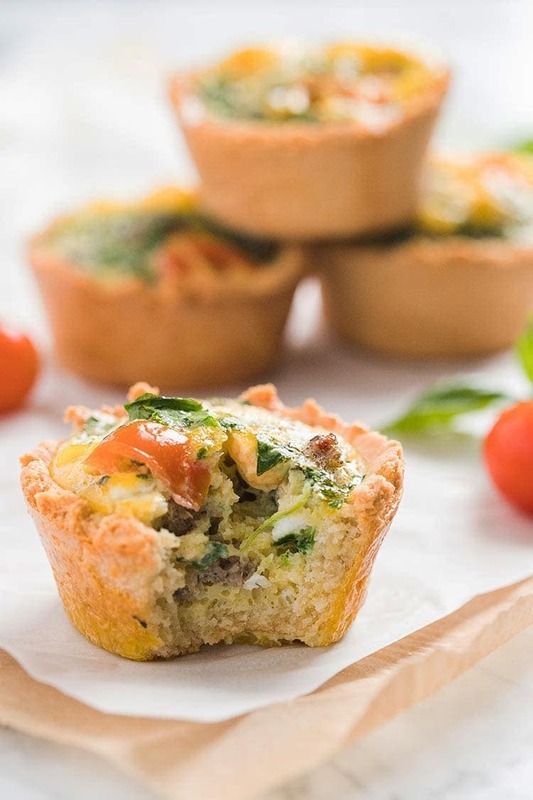 The elegance of an hearty egg quiche, the portability of a miniature size, and a low carbohydrate count to make them keto-friendly and gluten-free! 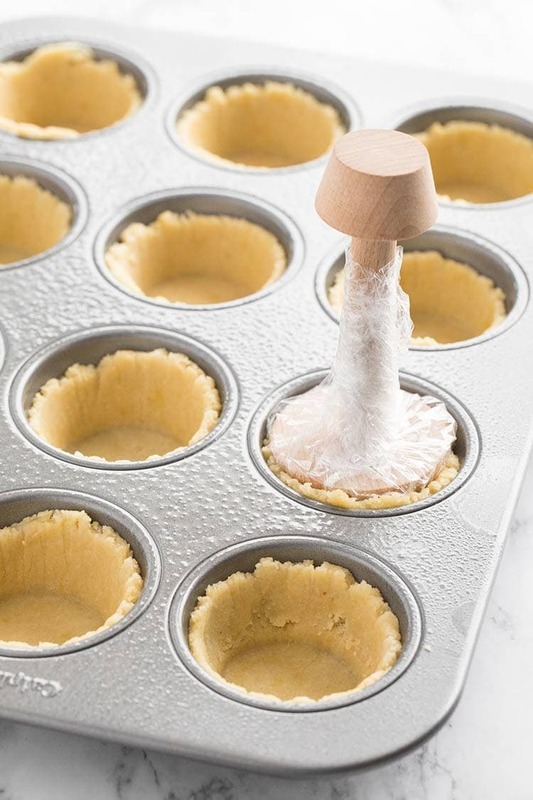 Liberally spray a 12-section muffin tin with non-stick cooking spray. In a medium sized bowl, add almond flour, salt and garlic power, and mix lightly with a fork. Add eggs and stir to combine. Dough will be dry at first, but keep mixing - it will come together and begin to form a large ball. Using a scoop or tablespoon measure, portion dough equally into muffin cups (about 2 tablespoons each). Place muffin tin in oven and bake crusts for 15 minutes, until the tops start to turn lightly golden brown. While the crusts are baking, add eggs, heaving whipping cream, basil, salt, garlic and onion powders to medium sized bowl and whisk to scramble the egg mixture. Add in sausage, tomatoes and chopped spinach, and stir gently to combine. Using a scoop or large spoon, ladle egg mixture into the baked crusts, filling as high as you can go without the egg mixture spilling out of the crust. Return muffin tin to oven, and bake an additional 20-25 minutes until the quiches are set in the center. Place cooled mini quiches in gallon ziptop freezer bag. Label and date, then place in the freezer. Remove frozen mini quiches from freezer, and place in refrigerator to thaw overnight. Place thawed quiche(s) in microwave and heat for 30-60 seconds. To make these dairy-free, you can substitute unsweetened coconut or cashew milk for the heavy whipping cream.